The Quirk’s Event is the brainchild of Minnesota-based Quirk’s Media. For over 30 years, the company has served the market research community by providing articles, directories, webinars, tools, and other resources. But in 2015, Quirk’s decided to go a step further. It hosted the first annual Quirk’s Event – an opportunity for market research professionals to network, learn, and share practical knowledge. The event quickly became one of the leading industry conferences, attracting over 1200 people. This year, Opinions4Good (Op4G) will be among those lucky attendees! We will also be an exhibitor at the event so we can spread the news about Op4G and what we have to offer. If that isn’t enough enticement, Op4G will award a free omnibus study to one random person who visits our exhibit (Kiosk L, near the entrance of the Exhibitor Hall)! The omnibus study is among our fastest and most cost-effective products. It is ideal for brand promotion, concept tests, or anything requiring a quick turnaround. Of course, those who don’t win the omnibus study can purchase one at any time. The first 3 questions (the minimum purchase) cost a mere $1100 total. Questions 4 – 6 cost $325 each and any further questions cost $300 each. But a special bulk rate applies for pre-booked blocks of 50 or 100 questions. Sometimes, bigger is better! Want more information on our omnibus studies and how they can benefit your firm? 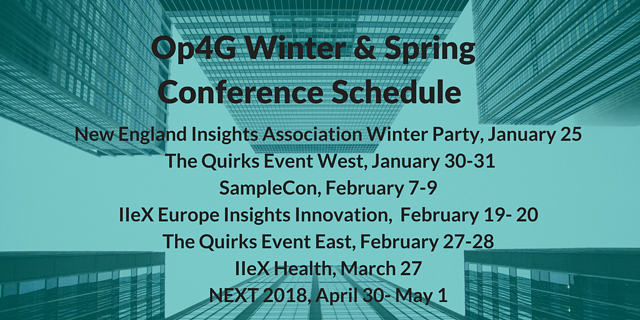 Download the one-pager below or contact Petea@op4g.com to set up your omnibus. Don't forget to stop by Kiosk L at the Quirk’s Event in Orange County January 30-31. It just might brighten up your winter!